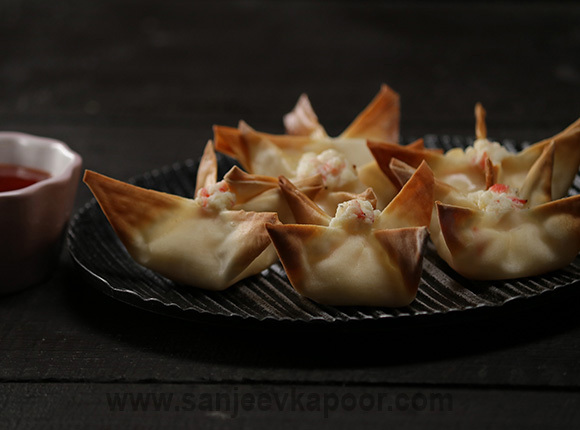 Flavourful crab mixture stuffed baked wontons. Take cream cheese in a bowl and mix to get a creamy texture. Add crab sticks and mix well. Add salt, crushed peppercorns, garlic and torn thyme sprigs and mix well. Cut wontons sheets into 2½ inch squares. Put some crab stick mixture in the center of each wonton piece, brush some water on the edges of the piece and bring all the edges in the center and press to seal.